The filmmakers of "I Can Only Imagine" have released a new trailer revealing the movie's plot as well as what role award-winning actor Dennis Quaid plays in the story behind the hit song of the same name. The upcoming film is based on contemporary Christian band MercyMe's 1999 hit song, "I Can Only Imagine." The song sold over 2 million digital downloads and was certified almost 3x platinum. The crossover hit went on to be one of the "most played Christian radio singles in history." Now, almost a decade later, the film will tell the story behind the tune. The trailer posted on Facebook features some of the dramatic scenes that take place in the emotion-stirring film. It also reveals that Quaid's character is the subject of the famous song — a hard man whose life was eventually turned around by God. The Erwin Brothers and Lionsgate have announced that "I Can Only Imagine" will be released in theaters nationwide on March 16. 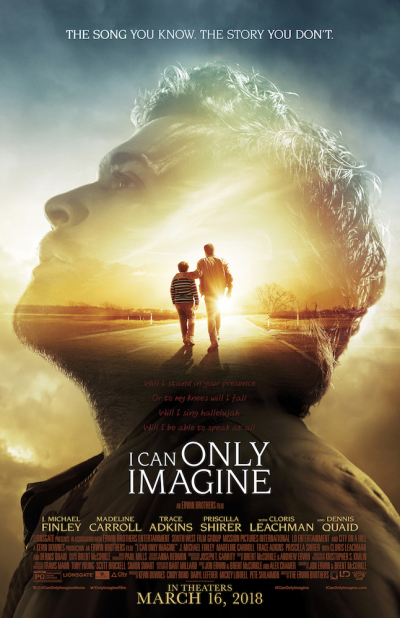 According to the movie's synopsis, "I Can Only Imagine" is the "true story that follows the life of Bart Millard, lead singer of the Christian band MercyMe, who loses his father to cancer and inspires him to write the mega-hit song, 'I Can Only Imagine.' The story beautifully illustrates that nobody is ever too far from God's love — or too far from an eternal home in Heaven." The film features an all-star cast, including Quaid ("The Day After Tomorrow," "The Rookie," "Soul Surfer"); Oscar winner Cloris Leachman ("The Iron Giant"); platinum-selling country music legend Trace Adkins; and author and actress Priscilla Shirer ("War Room"); and will introduce Broadway's J. Michael Finley ("Les Miserables"). In a recently released promotional video, Quaid explained that the movie highlights the power of a changed heart. "It's very uplifting, about how one can really have a complete change in one's heart and how much you can move the Earth with that," he said. Members of MercyMe are also thrilled about the release of the upcoming faith-based film. Millard revealed on social media that the project has been in the making for years. "I was first approached over five years ago. No turning back now," Millard wrote in January 2016 when they first announced the film on Deadline. For more information about "I Can Only Imagine," visit the movie's website.